Mayor Jenny Durkan and the Seattle City Council are right to call for repealing the city’s odious, divisive tax on jobs. Then they’ll have to rebuild trust with voters. Seattle’s flip-flopping leaders are finally making the right decision on the city’s odious, divisive head tax. The tax on jobs is likely to be vanquished after a surprise announcement Monday by Mayor Jenny Durkan and a majority of the City Council that they now want it repealed. Council members should proceed with a repeal ordinance at their special meeting scheduled for Tuesday. This would forestall a referendum that’s coasting toward November’s ballot. More than 45,000 signatures were gathered by referendum supporters, suggesting that plenty of Seattle voters are ready to vote down the tax. Repealing the tax on jobs is the right thing for Seattle. The ill-conceived measure would cause major harm to the city’s business climate and reduce job opportunities, while doing relatively little to end homelessness. Durkan and the council now have much work ahead to restore public trust. Credibility, not money, is what City Hall needs at this point. That includes trust in the council’s word. Less than a month ago, council members insisted the jobs tax was a moral imperative. 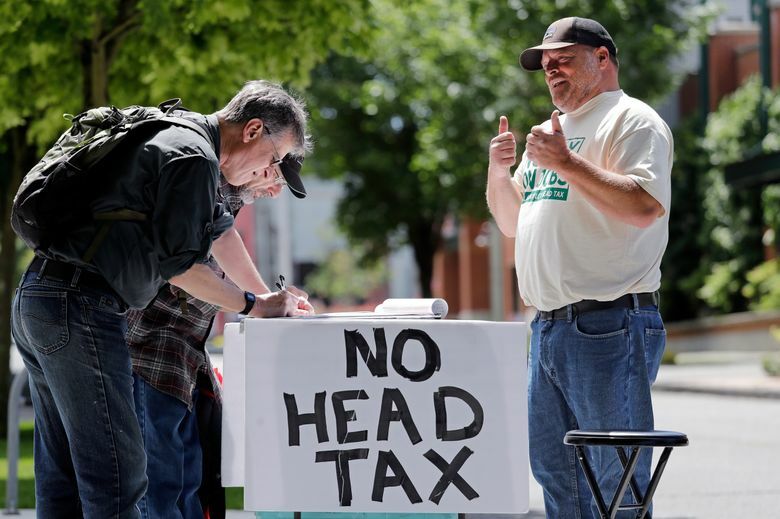 They ignored warnings from past mayors, other elected officials, the business community and other concerned parties and unanimously approved the tax May 14, to take effect in 2019. Seattle and King County also must build trust in the effectiveness of their well-funded homelessness programs before seeking more revenue. A major reason the head tax was opposed outside City Hall is because the public is tired of spending so much on the homeless crisis and seeing little overall improvement and accountability. Regional spending on the crisis is now around $200 million a year. That includes more than $70 million a year by Seattle, which has more than doubled spending on human services in recent years. Durkan is now on the right tack. Durkan also plans a new push with other mayors for regional and state solutions to the homelessness situation. That’s an important, overdue conversation. It also needs to take an expansive view of the region, to include not just Seattle and King County but everywhere people are displaced, unsheltered and critically in need of government assistance. Public support for these services will depend on governments’ performance, accountability and outcomes. The public also needs to see that elected officials are making sensible decisions in the best interest of the overall community, which Durkan and the City Council are finally doing by killing the head tax.